Any system as complicated as your automatic overhead door, will inevitably suffer wear and tear over time. From dented door panels and tracks to broken springs and wiring, our technicians can prevent dangerous accidents and solve inconvenient breakdowns. The most complex system in your garage is the opener. This is what controls the movement of the door, consisting of many interconnected electro-mechanical systems. There are plenty of things that can go wrong with your opener, from a worn-out motor gear to disconnected wiring. Luckily, our technicians know how to fix these issues as they arise. Our team also carries spare parts, so if any components need to be replaced, they can be swapped out on the spot. The torsion or extension springs that bear your door’s weight will weaken and wear out over time. If they break completely, they’ll put your door out of commission. When this happens, our technicians will work quickly to supply a new set. We strongly recommend that you don’t try to fix broken springs yourself; they can be extremely dangerous, and are best handled by professionals. Garage door panels pick up dents more easily than you'd imagine. Our technicians can remove the damaged pieces and replace them, leaving your door looking as good as new. We work with all the major brands, and can only supply parts from trusted manufacturers like Amarr, Clopay and Windsor. A dented track or a rusty roller can prevent your overhead door from working smoothly and reliably. Our technicians can swiftly replace any worn-out parts, and can remove dents in your tracks as well. They’ll also inspect your door’s frame for any signs of wear or damage that might have been caused. Our technicians can handle any problem - whether you need an emergency opener repair or a new door panel, we can help you. 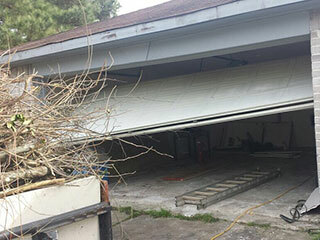 Contact Garage Door Repair Delray Beach today to find out what we can do for you.